Throughout much of the US, we backyard veggie gardeners are mourning the end of growing season—and remembering the fresh, ripe tomatoes of summer. We’re also faced with a culinary dilemma: What to do with all those green tomatoes that are still on the vines? They won’t have time to ripen, but we need to pick them before the first frost. Green tomatoes may not be as alluring as their ripe alter egos, but they have tart, bright flavor. Which makes them exquisite when combined with spicy curry. And cooking them takes just a few minutes. So you can have curry in a hurry. Green tomatoes of any size work well in this recipe, but I prefer the smaller ones. I reserve the big ones for Fried Green Tomatoes (a recipe I owe you). I adapted this recipe from one I found in our old, tattered copy of The Fannie Farmer Cookbook. The recipe calls for commercial curry powder (I like a Madras type best, but any will do). Although I often mix my own curry powders or pastes, the commercial version works extremely well in this dish, so that’s what I recommend. Preparation time for this recipe is about 5 minutes or so. Total cooking time, maybe 10. So you can have this dish ready to go in 15 minutes. This recipe makes 4 side-dish-sized servings. Leftovers keep for a few days when stored in an airtight container and refrigerated. Peel the onion and chop into dice of about ½-inch (more or less). Peel the garlic and chop fine. Peel the ginger root and grate, or chop fine. Heat a frying pan, preferably nonstick, on medium heat. When heated, add the oil. Once the oil is hot (it’ll shimmer), add the chopped onions, garlic, and ginger. Add the ½ teaspoon Kosher salt to season and sauté until the onions just become translucent (5 or 6 minutes). Meanwhile, wash the green tomatoes and chop them into pieces measuring about ½ to ¾ inch. When the onions are ready, add the green tomatoes, the curry powder, and the cayenne pepper. Sauté for 3 to 4 minutes, stirring frequently. You don’t want to overcook the green tomatoes—they’re done when they’re just beyond the raw state, but still fairly crunchy. Add additional salt to taste and adjust seasoning, if necessary. Remove from heat. Stir in chopped cilantro leaves, if using, and serve. IMO, green tomatoes should be served either lightly cooked (as in this recipe) or else cooked for a very long time. They tend to be a bit slimy when cooked to an in-between state. Green tomatoes look a little like tomatillos. The two are quite different, however (though either one makes a nice salsa). They have different flavors, so you really can’t substitute one for the other. If you want to make your own curry powder, here’s a quick recipe: Combine 1 teaspoon ground cumin, 2/3 teaspoon ground coriander, and 1/3 teaspoon turmeric. The flavor won’t be as good as commercial curry powder (which includes more spices), but you’ll be in the ballpark, flavor-wise. The original recipe specified butter rather than a neutral oil for the fat. Overkill, IMO. Olive oil also works quite well in this recipe, so you could substitute that for neutral oil if you prefer. “Keeper!” said Mrs. Kitchen Riffs, sampling her Curried Green Tomatoes. “They’d be great with some Indian dishes,” said Mrs K R. “Like Aromatic Yellow Rice and Pink Dal with Swiss Chard." “Absolutely. Plus, this dish is quite a bit healthier than deep-fried fare,” I said. Ah, yes, home economics—the Mrs K R way. Hi Nee, there are so many great things one can do with green tomatoes, aren't there? Cha-cha sounds most excellent! Thanks for the comment. Your photos are amazingly inviting. I would have loved to have a piece of this beauty. I saw a couple of green tomatoes here in Buenos Aires - and this looks like a fantastic appetizer! Hi cquek, this really was a great dish - something I'll be making again, and soon. Thanks for your kind words and comment. Hi veganmiam, this is a great dish - loads of flavor, and of course it's vegan. ;-) Thanks for the comment. I've never used green tomatoes for anything but the fried variety...but I love the flavor of curry and this is a great idea; love that it's from such an old book too! Hi Barb, fried green tomatoes are hard to beat, but I think I like this dish better. And it's healthier! I'm a real curry fan too. ;-) Thanks for the comment. First of all, I loved Curry in A Hurry, a restaurant in downtown STL. (I don't know if they still exist, but you reminded me of them.) Second of all, I have a gazillion green tomatoes and am never as enthused about them in October as I am in July. I'm totally giving this a try! I love green tomatoes too...What a great, flavorful dish, John! Oh em gee John. I can totally picture these on top of a burger. And it's a great picture. You really outdid yourself with these. Curried green tomatoes, freaking fabulous dude. Love it. All I got this summer was green tomatoes. Weird growing season. I love pickeled green tomatoes (grandmother's recipe) and I am sure I will like this curried version. Looks absolutely delicious and very healthy. Never tried to cook with green tomatoes, interesting recipe. I can see the usage of this in many ways. Now I just need to find some green tomatoes! We love tomatillos but we've never tried green tomatoes before. Are they sour at all? Thank you for sharing John. These look delicious! Never thought of doing a curry on those green guys left on the vines. I always think of "fried green tomatoes'' instead like everyone else. Thanks for giving us another tasty alternative. Now this is a different recipe. I'm sure I'd love this, very unique. Nice tip on homemade curry powder. Hi John... I've never tried Fried Green Tomatoes of any kind before, but your recipe has certainly inspired me! Great. Many thanks! Incidentally, I have a wonderful Luke Nguyen recipe on my site for a green tomato salad too, just in the event you have too many! Hi Kelly, I had totally forgotten about that restaurant! Anyway, this is a really good use for all of those green tomatoes. ;-) Thanks for the comment. Hi Denise, don't green tomatoes have great flavor? I'll bet you'd enjoy this dish. ;-) Thanks for the comment. Hi Kim, this would be good on a burger! But they're darn good all by their lonesome. ;-) Thanks for the comment. Hi Debra, we got a lot of green tomatoes this summer too! We had ripe ones in July that the squirrels all ate, then finally got some ripe ones again a few weeks ago. All the others have been green - hence, this recipe. ;-) Thanks for the comment. Hi Asha, it's really good! Worth trying. ;-) Thanks for the comment. Hi Charlie, green tomatoes are indeed regular ones that haven't ripened. I had forgotten that there are some heritage tomatoes that are green when ripe - but they're not what I mean for this recipe. One of these days I should do my Fried Green Tomatoes. ;-) Thanks for the comment. Hi Monet, they're a bit sour, but awfully tasty. They're worth trying if you find some someday. Thanks for the comment. Hi Carolyn, these are really good curried. I was surprised that I like them better than Fried Green Tomatoes. ;-) Thanks for the comment. Hi Terra, I'm so looking forward to cooler weather too. ;-) And there are a lot of great green tomato dishes out there, aren't there? Thanks for the comment. Hi VIcki, this really is a fun recipe - worth trying. That's a pretty simple curry powder, but it works well in a dish like this that also includes fresh ginger and garlic. Thanks for the comment. Hi Lizzy, I'll have to check out your Luke Nguyen recipe! 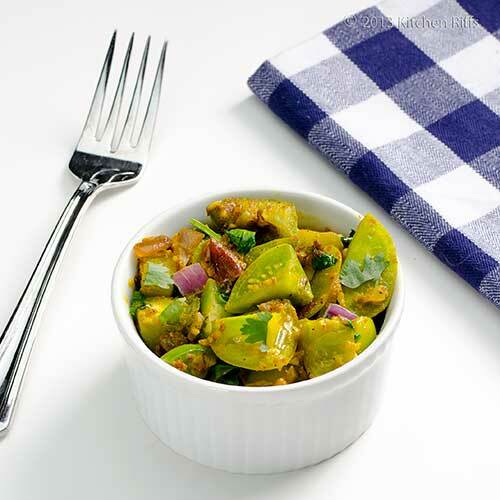 And you should tried these curried green tomatoes sometime - wonderful flavor. Thanks for the comment. Who knew there was any recipe other than frying for green tomatoes! Love this much healthier option! I need some green tomatoes stat please. Bet this is super tasty. I love curry! How did the garden turn out after all those pesky rabbits? Hi Liz, this really is pretty healthy. And incredibly tasty! Really a winner, IMO. Thanks for the comment. Hi Abbe, you do need some green tomatoes! Rabbits got a lot of the lettuce, etc., but didn't touch the tomatoes. Squirrels did those in! But then I got some netting up and salvaged most of the season. We have raised beds, and next year I'm building some PVC frames (or cages) and covering them with chicken wire, and will place them over the raised beds - so (I hope!) nothing will get through. We'll see if that actually works - stay tuned. ;-) Thanks for the comment. Hi Uru, these are really terrific - worth trying. Thanks for the comment. This is so creative and such a great use for green tomatoes! Hi Alyssa, this was a really fun dish to cook and eat! It's different, and really, really good. ;-) Thanks for the comment. Hi Kumar, isn't that color outrageous? And the dish is so good - I'd love to see how you'd spice it up! ;-) Thanks for the comment. Hi Kiran, LOL, we do indeed need to enjoy our summer crop while it's cropping! Thanks for the comment. Nice use of green tomatoes John! Never thought of currying green tomatoes but I bet they're tasty. Going to try this if I can find green tomatoes, I'm only seeing the heirloom green ones now. Thanks for sharing John! Hi Nazneen, this is a dish I think you'd really like. Definitely worth looking for some green tomatoes just so you can play with it. ;-) Thanks for the comment. Hi Kalyan, it really is a mouthwatering dish! Truly lovely, IMO. Thanks for the comment. An interesting dish and scrumptious combination! This sounds delicious John! I have a hard time finding green tomatoes here. I'll have to try it with green heirloom tomatoes, as that's what I substitute for whenever I need green tomatoes. YUM! This looks great... I could just grow green tomatoes and make this curry... then I would beat the caterpillars that always get my tomatoes!! This is a great use of those green tomatoes! I love recipes that use up things like this so that they aren't wasted. It looks really flavorful. I just pickled some green tomatoes recently! Hi Rosa, it really is a nice dish. And a bit different, too. Thanks for the comment. Hi Anne, I haven't really worked with the green heirloom tomatoes so I'm not familiar with their characteristics, but if they have quite firm flesh they should work in this dish. Thanks for the comment. Hi Gourmet Getaways, I may do just eat green tomatoes next year if I have the same squirrel problem I had this year! The squirrels got more tomatoes than we did. :-( Thanks for the comment. Hi Amy, pickled green tomatoes is a great dish! Thanks for the comment. Hi Judy, maybe your friend will send some curried green tomatoes your way. ;-) Thanks for the comment. I always wonder what to do with green tomatoes other than fry them. This is a great idea, though fried green tomatoes are pretty awesome. I totally agree...I miss the tomatoes from the garden...so does my Baby Girl! 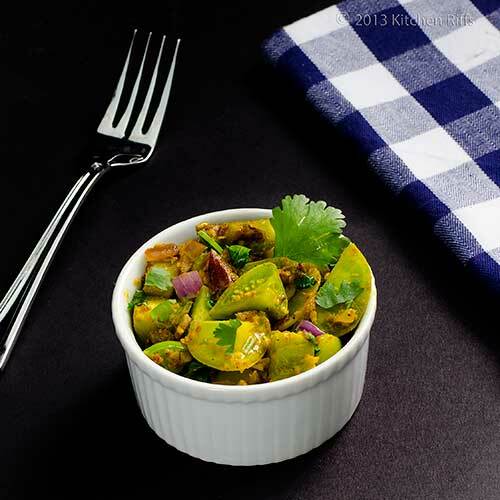 :) Your curried green tomatoes sound wonderful and what a great use of those "left over" green tomatoes! Hi Ray, it's definitely worth trying the combo of green tomatoes and curry - I think you'd like it. :-) Thanks for the comment. Hi Laura, I agree fried green tomatoes are wonderful. And I won't stop making them. But these may actually be just a tiny bit better! Thanks for the comment. Hi Amy, green tomatoes have such an interesting flavor! Although I prefer ripe tomatoes, green ones are always a treat. Thanks for the comment. Hi Sue, welcome! Glad you like this recipe - it's a good one! Thanks for the comment. This comes just in time. The only yield that my garden had this year was green tomatoes, besides a lone sad cucumber. Love the colors and the clicks. I just ate and now I'm hungry again! Love the vibrant green color! Hi Minnie, we got a lot of green tomatoes, too, although in September we got a bunch to ripen, thank goodness. Thanks for the comment. Hi Ashley, sorry about that hunger thing. ;-) Isn't that color terrific? Thanks for the comment. Hi Greg, we had a lot of squirrel thieves this year, too. We finally outwitted them, though! And I have an idea for a better fix next year. We'll see, though - they can be frustrating. Thanks for the comment. Boy Nee wasn't kidding when she told me I had to see your Curried Green Tomatoes, John. It just so happens that I'm picking up a bunch of green tomatoes later this week. My friend Katie grew tons of tomatoes on her Amish farm this year and many of them are still green. (very strange tomato growing season this year:) She's sharing!!! I plan to try and ripen some of them in newspaper but the others, oh my! Leave it to Fannie to come up with an amazing timeless recipe. Thank you so much for sharing, John. I just happen to have some Madras in the cupboard too! Hi Louise, we had a really strange tomato growing season too. Weird. Glad you like this recipe! It's really a good one - enjoy! ;-) Thanks for the comment. Quick meals are the best! I have never tried a green tomato...can you believe that?! I adore green tomatoes - have used them in salsa but never have thought to use them in curry - this is truly wonderful! Lovely color of this curried tomatoes. The flavors sound so good! Hi Kristi, I think most people who eat green tomatoes are those that grow them, and have late season, unripe ones to consume! Really good, though. Thanks for the comment. Hi Shashi, aren't green tomatoes good? They're wonderful in curry, I discovered. Thanks for the comment. Hi easyfoodsmith, isn't that color gorgeous? And the flavor is, too! Thanks for the comment. I am always learning new things on your blog...I never thought in cooking green tomatoes...even less with curry...sounds and looks delicious. I love the colors! Hi Juliana, green tomatoes really have an interesting flavor - worth trying. ;-) Thanks for the comment. What a great alternative to fried green tomatoes. Of course, when I do find some green tomatoes, it's very hard for me NOT to fry them. :) Next year I'll have my own tomatoes plants so I'm pinning this salad for when I have those small green ones. This salad does sounds quite tasty! Hi MJ, it's pretty hard to pass up fried green tomatoes, I admit. ;-) These really are good, though, and might be just a tad better. Maybe. Depending on my mood. ;-) Heck, I'll just make both! Thanks for the comment. What a tasty way to celebrate the end of the season! Love the idea to "curry" the tomatoes. Frankly I've never cooked with green tomatoes before, we always get them fully ripe here, but that curry does sound wonderful! I have never cooked with green tomatoes before. I think I will have to change that, since I have lots of green tomatoes in my garden. Great recipe! Thanks for sharing. Hi Julia, you tend to see green tomatoes in farmer's markets more than in stores - stores usually carry ripened ones, at least in my experience. So they're one of those things that home gardeners tend to cook a lot! Worth looking for, though. Thanks for the comment. Hi Daniela, this really is a nice treat to celebrate the end of tomato season! Thanks for the comment. Hi Gintare, in the US it's mainly backyard gardeners that get green tomatoes these days (although I see them at farmer's markets, too). They're good, though - worth developing a source! Thanks for the comment. Hi Dawn, since you have green tomatoes, this recipe is for you! A different flavor from regular tomatoes, but good. Thanks for the comment. 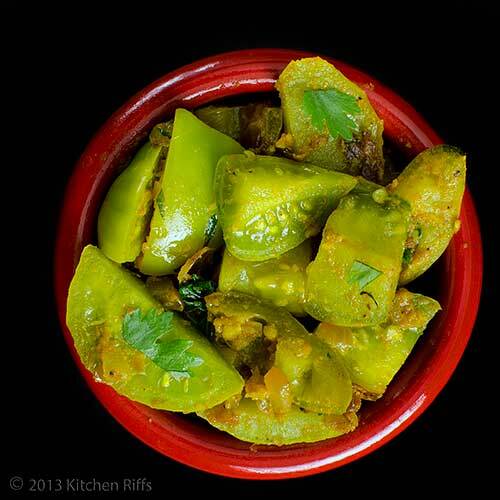 I use green tomatoes in various Indian dishes and they can go well with rice or rotis. Its about time to get the green tomatoes from the garden as they are not going to ripe. Wish summer was longer. Hi John, haven't try green tomatoes but your this curry recipe look really good. Thanks for sharing, I presume it taste good with briyani rice. Hi Shibi, I can imagine there are a lot of Indian dishes using green tomatoes - they go so well with the spices and flavorings. Definitely about time to harvest your green tomatoes - where you live you could have frost any time. Thanks for the comment. Hi Amelia, I haven't tried this with briyani rice, but I think it'd be a terrific combo. And you really should try green tomatoes if you have the chance - they're quite good. Thanks for the comment. I have to pass this along to my fellow gardners who have more than their share of green tomatoes. Hi Kristi, we had a bunch of green tomatoes this year, too. Hence, this recipe. ;-) Thanks for the comment. I reviewed The New Jewish Cookbook a few months ago and in there they have a recipe for a fried green tomato sandwich that I have been dying to try. Now after seeing your recipe I don't know which I would try first, your recipe or theirs if I am lucky enough to run across some green tomatoes. Hi Karen, the other day on a blog (I forget which one) I saw someone substitute a fried green tomato for the regular tomato in a BLT. Sounds like a fun idea! We had plenty of green tomatoes this year, alas, so we've done multiple things with them. Thanks for the comment. I'm from Mississippi so fried green tomatoes were a part of my diet long before they became so popular across the country. That's really the only way I've had green tomatoes. I love finding another way to enjoy them. Thanks for sharing a great recipe! Hi Bill, it's pretty hard to beat a fried green tomato, but I think the curried ones do. Maybe. ;-) Taste testing is definitely required! Thanks for the comment. I always remember the movie, Fried Green Tomatoes at this time of year. Love your curried version! Hi Kitchen Butterfly, that's such a fun movie! 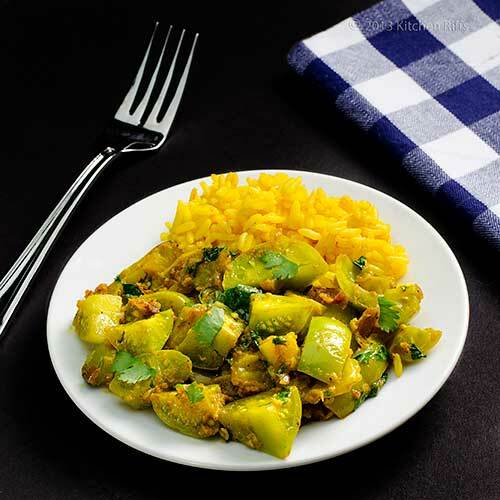 These curried green tomatoes are great - really worth making. Thanks for the comment. I haven't had a chance to try fried green tomatoes yet and now this is another green tomato recipe that I shouldn't miss trying! I think everything "curry" tastes delicious! Hi Nami, fried green tomatoes are definitely worth playing with. Check out farmer's markets - they often have them. And I agree with you that curry anything is wonderful! Thanks for the comment. Hi Paula, curried anything is wonderful, I agree. One of my favorite flavors! And it works so well with green tomatoes. Thanks for the comment. I am intrigued! I haven't cooked much with green tomatoes but one year I made chutney with them, so I can imagine well-spiced curried green tomatoes would be terrific. Thank you for sharing! Hi Hannah, our goal always is not to cook much with green tomatoes, but the weather never cooperates, so we always have some at the end of the season! Chutney is a terrific way to use them, and if you like that, I'll bet you'll like them curried. Thanks for the comment.